Some Reflections from Educon — and it isn’t over yet! On my way down Arch Street this morning, walking to SLA for the last day of Educon, I listened to a TED audio podcast, an interview with Richard Branson, of Virgin-Atlantic Airlines, conducted by TED curator, Chris Anderson. 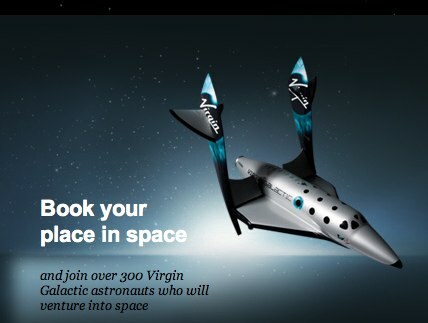 I didn’t know anything about Branson, except for Virgin… and his interest in space travel. So it surprised me when Anderson mentioned that he (Richard) did not have a very successful education experience. Branson admitted to being dyslexic, and that he never really understood school work. He left school at 15. Here’s what I wanted to say, but didn’t, for fear that it would come across as callus. I wanted to say — should have said — “It’s already too late!” “It is too late to enable that student, who is ready to become an adult. It is too late for your high school to capture the potentials of that student and benefit from the contributions she might have made, if her personal talents had been recognized, encouraged, and harnessed.” I applaud this young teacher for here position, and for what she may be doing for older high school students, and, “Keep doing it.” We need to do all that we can. I’m not suggesting that we give up. Author David WarlickPosted on January 31, 2010 January 31, 2010 Categories educationTags education, education20, educon, educon22, warlick7 Comments on Some Reflections from Educon — and it isn’t over yet! One of the best things about Educon is the nature of the sessions, called “Conversations.” It is unconference in practice, meaning that the session leader does not teach for learning, but, instead, his job is to generate conversations among the attendees from which everyone learns. It is not a hive mind at work, but a sharing and mixing of many ideas and perspectives, from which group and individual meaning can be found. It is beautiful! I have led numerous such unconference sessions, mostly to the delight of participants, who often write in their evaluations that these sessions were among the most rich in learning. I continue, though, to walk away feeling that I didn’t do my job, because I didn’t teach anything. It’s the school romantic in me. I’ll get over it. I have felt, for some time, that the conversations I facilitate lack anchor points or magnetic positions around which to latch ideas. They are typically rich in backchanneling, which will certainly be the case at Educon, and there is great value in using each other for gaining traction. But I’ve felt for a while that something more firm was needed. 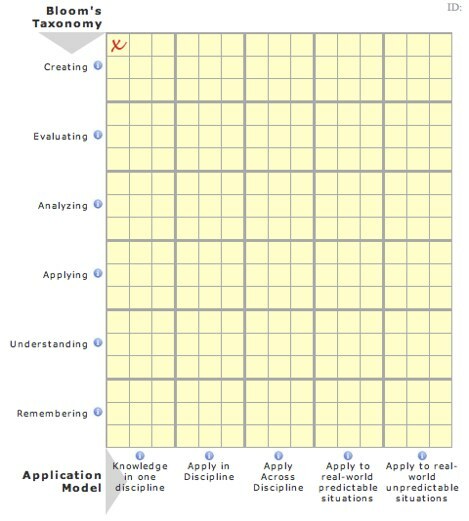 So, in addition to channeling ideas through Twitter, during my conversation, I will be asking participants to map their ideas along a bi-directional rubric (see “Participant Grid” on right), giving us all a ladder, on which to climb as we suggest ways of ramping up traditional classroom practices (all recently witnessed in existing classrooms) into learning experiences that take thinking to a higher level and make learning a more relevantly active engagement. 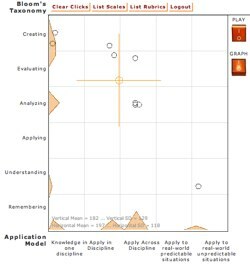 Participants will load a rubric onto their computers, with two scales, Bloom’s Revised Taxonomy going vertical, and Daggett’s Application Model along the horizontal. 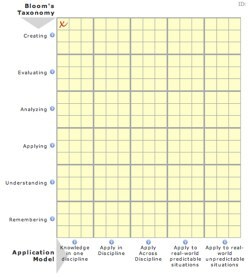 I will suggest a classroom learning experience that was recently witnessed in a classroom, asking participants to click the point on the grid at the point of intersection along each scale. A grid will be displayed (see “Group Grid” on right) that shows all of the participant’s clicks, indicating where individuals and the group think we are with the activity. 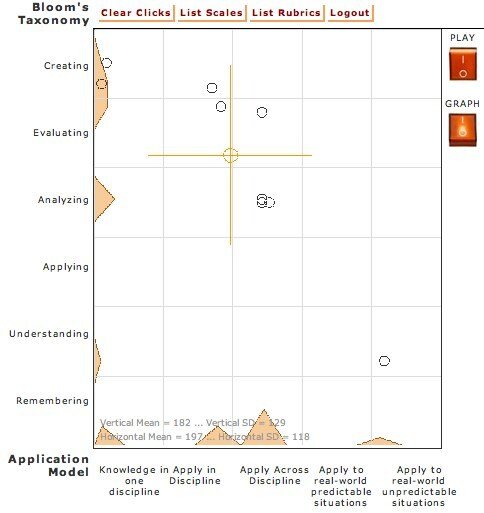 My goal is to use the tool to steer conversations about specific learning practices, drilling through the theory to describe exactly what teachers and learners are doing, and perhaps even suggest learning experience that no one in the group has yet imagined. ..Or it may not work at all. That’s the thing about conversations. They wouldn’t be interesting if they didn’t go in unpredictable directions. 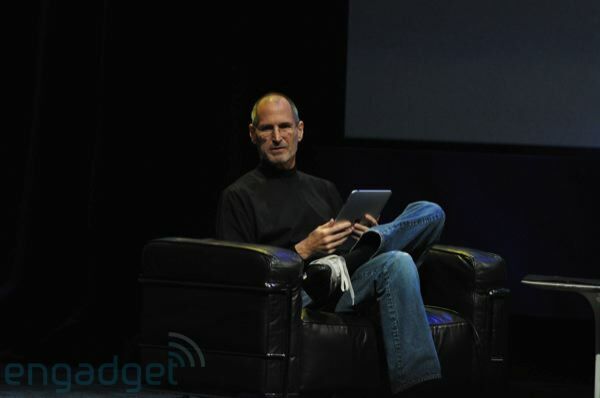 engaget photo of Steve Jobs & his iPad ((Attias, Cyril. “Apple iPad Keynote.” Flickr. 27 Jan 2010. Engaget, Web. 28 Jan 2010. <http://www.flickr.com/photos/newyork/4309048745/>. I was riding back from Salisbury, yesterday, while Steve Jobs was announcing Apple’s new iPad. The best I could do was read a live blog, updating with the features and peppered with the writers skepticism and acknowledgement of the Jobs mystique. I left it a bit underwhelmed, hoping for something a little more earthshaking. However, upon getting home and doing a Google search for iPad and video, I found a link to this Mashable blog post (Official Apple iPad Demo [VIDEO]) with an embedded Apple promotional video about the device — and “I’m sold,” as I announced on Twitter just after viewing piece. I’ve been thinking about the device since — and why I am so sold on it now, despite my admitted disappointment over not being rocked by something really “Amazing.” A core question I’ll be asking myself as time goes on is the iPad’s suitability as an institutional learning tool. But, quite frankly, we have bigger problems than that. Life before text messaging feels harder to imagine than life before the wheel. I neither glorify nor decry the digital age. Technology does change us and how we act, but so does every minute of the day: every handshake, every look skyward, every farewell. Continuing on to answer the question that haunts us all, new technology impacting teaching and learning? I have never understood how technology enhances learning. The only digital age staple I see nowadays is PowerPoint, a tool that has become more of a crutch for teachers than a study guide for students. And we all have our experiences with Blackboard (and its pandemic lack of use by professors). From what I see, little has changed in education, given all the technology that has been imposed on it. Although there are many valid reasons why formal education has resisted the transformations indicated by technology, and more importantly, by a new information landscape. There’s no excuse. But we all know about the barriers. What truly disturbs me about Michael’s piece is that he seems so indoctrinated to a teacher-, textbook-, standards-directed education experience that information and communication technologies seem to have little impact on his vision of himself as a learner. 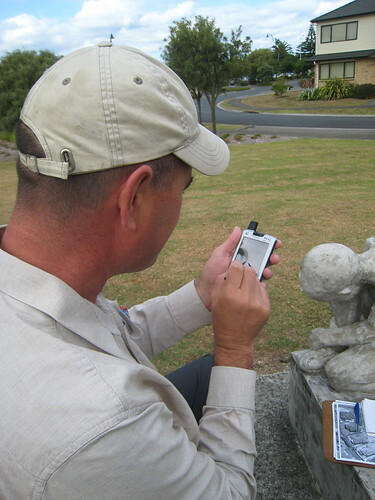 To illustrate his dismissal of digital technology as a learning tool, he shares an anecdote. A film historian once asked my high school media class what we thought films were stored on. He answered: old 35mm. DVDs, Blu-rays, even VHS — he wouldn’t touch the stuff, he said. 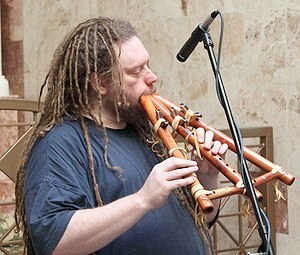 It takes advanced technology to play those. But 35mm takes light, a wheel and something with which to turn it — nothing else. We aren’t quick to embrace technology in our learning because the old lecture-and-notebook way of doing things works (and has always worked). Most of the time this technology requires experts to work it correctly and the right generation to receive it. We aren’t that generation. It’s a perspective that is narrow, institutional, and wholly out of date — and it percists. Unable to find a table at Starbucks Thursday morning, I took a chair offered by a woman who looked like she was finishing up her pastry and would soon be leaving her table — to me. She was a regular and knew why I was there. We started talking and she told me about the numerous and wildly varied jobs she had held since graduating from UNC with a degree in “Peace, War, & Defense.” I finally asked her, “So what do you want to be when you grow up?” I hope I asked it in the playful way that I’d intended — because she seemed a bit taken-aback by the question. Thinking about it this morning and visualizing my archetypal learning-resistant educator, what I see is a grown-up, someone who is doing the last thing they want to learn to do. Of course we’re all always learning and we all plan to develop new interests, skills, hobbies, etc, as we go along. No one ever intends to stop learning, and being “grown-up” is certainly not an exception. I saw that quote on a slide at a conference I attended last year, and it rings true to me. But it doesn’t say to me that we should resist growing up. It’s says that we should never stop playing and being playful. 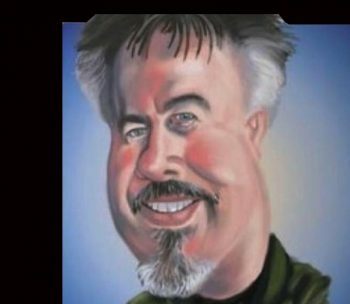 Author David WarlickPosted on January 22, 2010 January 23, 2010 Categories education23 Comments on Do Grown-Ups Learn? Gary Stager pointed this one out, via Twitter, @’ing it to Will Richardson, Chris Lehmann, and myself — including me in very fine company, I might add. 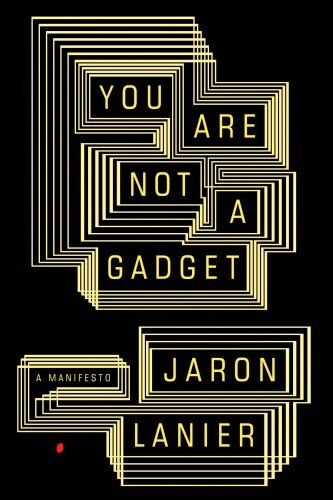 It’s about a new book by Jaron Lanier, You are Not a Gadget. Perhaps most known for popularizing the term, Virtual Reality our paths intersected several years ago through Advanced Network and Services, where he was exploring potential VR applications of Interent 2 and I was working with ThinkQuest, which was created by Advanced Network. He’s a fellow that some readers of my blog might find a bit odd, but mostly he is oddly talented, described as a computer scientist, composer, visual artist, and author. The problem is not inherent in the Internet or the Web. Deterioration only began around the turn of the century with the rise of so-called “Web 2.0” designs. These designs valued the information content of the web over individuals. It became fashionable to aggregate the expressions of people into dehumanized data. The phrase “Design by Committee” is treated as derogatory for good reason. That is why a collective of programmers can copy UNIX but cannot invent the iPhone. There is nothing in the interview that I disagree with, and some things, about which I have expressed deep concern in 2¢ Worth. He rightly claims that, “..if the issue is contentious, people will congregate into partisan online bubbles in which their views are reinforced.” “Partisan Mobs,” he calls them. But all in all, I think that Jaron is attacking, what is attackable about Web 2.0, specifically questioning the arguments of its champions, and not so much the evolving applications that regular people are using in the participatory Web. I look forward to reading this book on the train, on my way to Philadelphia. I just watched an interesting video archive of a Q2Cfestival session (October 2009, @ Perimeter Institute, Waterloo, Ontario). The panelists were Neil Gershenfeld, Director of the Center for Bits and Atoms at MIT; Raymond Laflamme, Director of the Institute for Quantum Computing at the Perimeter Institute; Jaron Lanier, Computer Scientist, author, composer, musician, & artists; Neal Stephenson, Author; and Tara Hunt, Author and Marketing Consultant. The title was Wired 24/7? On the 14th, I wrote a blog post (Applying PLN — a Continuing Question for Me), questioning some of my own assumptions about expecting educators to embrace learning practices — cultivating personal learning networks. I wrote about my feeling stumped by administrators in Colorado last week, wishing that I had the answers to their questions about promoting more relevant learning in their classrooms. In truth, like most of the rest of the session, some excellent ideas came out of the conversation that erupted, after it was revealed that I had no easy answer. The thrust of the discussion was the culture of the school, and the expectations that the culture places on its members. “This is where learners of all ages are not just memeorizing facts and mastering skills — but working with new knowledge, constructing new knowledge, and impacting others through their work. Open your faculty meetings with something that you’ve just learned – and how you learned it. It does not have to be about school, instruction, education managements, or the latest theories of learning. Make frequent mention of your Twitter stream, RSS reader, specific bloggers you read. Again, this should not be limited to job specific topics. Share links to specific TED talks or other mini-lectures by interesting and smart people, then share and ask for reactions during faculty meetings, in the halls, or during casual conversations with employees and parents just before the PTO meeting. Include in the daily announcements, something new and interesting (Did you know that a California power utility has just gotten permission to start buying electricity from outer space?). Ask students in the halls what they’ve just learned. Ask them what their teachers have just learned. Ask teachers and other staff to write reports on their latest vacation, sharing what they learned – and publish them for public consumption. Ask teachers to devote one of their classroom bulletin boards to what they are learning, related or unrelated to the classroom. Include short articles in the schools newsletter and/or web site about research being conducted by the teachers – again, related or unrelated to the classroom. Learn what the parents of your students are passionately learning about, and ask them to report (text, video, Skype conversation, or in person to be recorded). 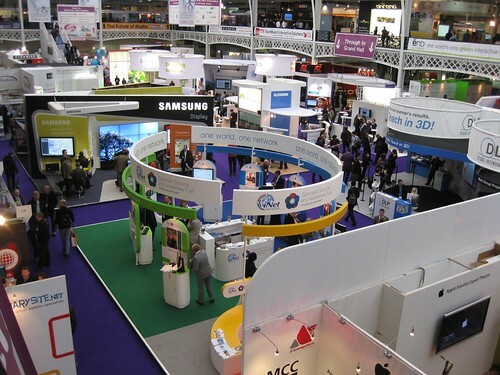 Last week was BETT 2010, the British Education and Training Technology conference, in London — arguably the largest education and technology conference in the world. I have not attended one, but it is one of my goals to do just that. Although we are all facing similar problems and challenges in education, Great Britain is in a different place from us, in the U.S.
Terry Freedman, with whom I will be working in Singapore at the iCTLT conference in March, wrote a very useful list of 7 Things to Do After the BETT Show — or any ed tech conference. Here is an shamefully abbreviated version, so please go to Terry’s ICT in Education blog to read it in full. I was just scanning the news and saw “West Virginia Expands Science, Technology, Engineering, And Mathematics Education with ESRI Software.” I think that this is great and that West Virginia and other states should invest in ramping up their STEM programs. But am I the only one who feels a spasm in my back as we STEM here and STEM there and continue to be feed the line that Science, Technology, Engineering, and Mathematics are THE key to a prosperous future? We are not in this state of near desperation today, struggling to fund education and other essential services, because people didn’t have enough STEM. This happened because some educated people thought that they could game the economic system for their own selfish and greedy gain, under a “see no evil” administration, and that they could do it without consequences. What history teaches, is that THERE ARE ALWAYS CONSEQUENCE. Interestingly, I find that the article, appearing in The American Surveyor, was actually written by ESRI, the GIS software that West Virginia is licensing for its schools, and that the focus of its use and the state offices that are promoting it are all social studies. I guess that “West Virginia Expands Social Studies with…” doesn’t have the right punch — that it wouldn’t make us more “competitive” in the culturally diverse global market place. Am I the only one who is afraid that the cost for STEM is Art, Music, Drama, and history, culture, geography, and economics? Thinking and problem-solving are over-rated, if you don’t have a valid context to think and solve within. 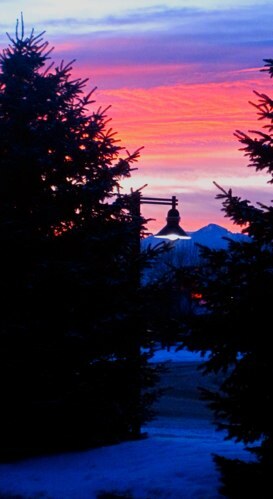 I had a great couple of days, last week with folks in Loveland, Colorado, starting off with a wonderfully stimulating dinner conversation with some of the district’s (Thompson School District) tech coaches. I wrote about it here. The next day (Saturday) started off with a keynote for area educators involved in a district initiative and other invited members of the local ed community — great to meet Jim Folkestad, from Colorado State University. 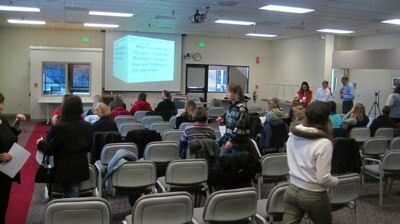 The keynote seemed well received and was followed by some closing remarks by the districts superintendent, Ron Cabrera. All was well until I spent forty-five minutes of casual conversation time with some of the districts administrators. First of all, being a conversational session, I tried to extract answers from the audience, going for conversation rather than Q&A — and it always makes me uncomfortable, not being the source of all answers. I admit it. Then someone asked, how to get teachers on board with transforming their learning environments — and all eyes were on me. I launched into my position that although formal professional development opportunities are important — we will not be able to just workshop teachers into the 21st century. Then I touched on personal learning networks, trying not to give away too much, since that was the presentation I would be doing after lunch. I started to run through a process that I have suggested in previous blog entries, of starting with about four or five teachers, and introducing them, at-ready points, to a progression of Web 2.0 tools, starting with asking them to start blogging about their daily experiences. Heads started shaking, almost immediately. Now these administrators were there because they chose to spend there Saturday with other educators exploring technology. So they were not looking for excuses — which is often the case. They saw real barriers to what I was suggesting, which was particularly disconcerting, since I’m just started that chapter in my current book project on PLNs. They rattled off a string of challenges facing their teachers, foremost being Colorado’s high stakes tests. It’s forced me to table my writing for a few days and think through how to promote personal learning in your education community. I’m actually wondering if it might it be unrealistic to be expecting all teachers to take on the role of “Master Learner.” There’s just too much of the instructional industrial complex that’s standing in the way. It’s one of many reasons why high stakes tests are actually harmful to our children and their opportunities. Mainly, I am telling this story because of a link to a recent Alfie Kahn article, to be published soon in Education Week, Debunking the Case for National Standards. He does a much better job than I of making the case. While our students can do so much more as active learners than ever before, we are measuring their learning in the oldest and most limiting ways possible. Another one that resonated with me was his comments about project-based learning, a concept that nearly everyone agrees with and subscribes to. But he said that if a teacher is applying projects to meet standards and improve or maintain test scores, then it isn’t project-based learning. It’s doing projects along the way. …The work that students are doing is the most important thing, not the answers they can put on the test. It Wasn’t the Same that it Was a Few Minutes Ago! I took this picture, walking out to the car last night. I know that some keynote speakers do not do this as a general rule, because it is “work,” and I understand this position, but one of the best parts of my job is getting invited to dinner by local district ed tech leaders or conference organizers the evening before the event. Granted, I’m not always excited about it, when I’ve been traveling all day and I’m tired. But I’m always (ALWAYS) energized and I’m always going back to my room with something I didn’t know before. Last night it was with four folks of the Thompson School District, in Loveland (love´-lund), Colorado, just south of Fort Collins. Diana (sorry if I get the names wrong) is experiencing her first Colorado winter, a former eMints coach from Missouri. She shared a lot about the structured eMints approach, and the adaptability that is enabled by their constant collaborations. Jenny comes from the media side and is with redefining the school library and asking all the right questions. Monica Monika is one of the most innovative and open educators I’ve met — and courageous. In a district that has things fairly locked down (like most), she’s convinced the PTB to open her classroom and ask her students to bring their computers to class and integrate (students are asked to integrate the tech). And then Kellie Bashor, the district technology integration coordinator, did what good leaders do — she listened. I think that the high point for me was when Diana was asked what she would be presenting tomorrow (today) at the district’s staff development event. She said, “It’s Not the Same Thing it was Going to be a Few Minutes Ago.” That is the perfect title for a conference presentation, and I got her permission to use it. One of the stats I’ll be including in my keynote this morning is that only a few years ago, the world was doubling technical knowledge every two years. At some point, during 2010, knowledge will be doubling every 72 hours. The the test answers are going to be changing. We need to get rid of the high-stakes tests. They are irrelevant, counter-productive, and harmful to our children and their future. Author David WarlickPosted on January 9, 2010 January 9, 2010 Categories education, literacyTags assessment, education, learning, warlick7 Comments on It Wasn’t the Same that it Was a Few Minutes Ago!